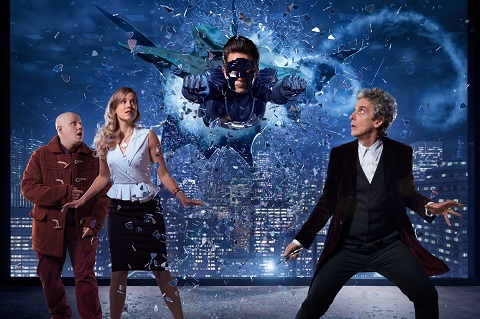 The special, titled Doctor Who: The Return of Doctor Mysterio, saw The Doctor (Peter Capaldi), Nardole (Matt Lucas), a journalist, and a superhero team up to save New York City. The cast also included Charity Wakefield and Justin Chatwin. The Christmas special “delivered 1.7 million total viewers, including nearly 900,000 adults 18-49 and adults 25-54, in Nielsen Live+3 ratings,” making it BBC America’s top-rated telecast of the year. The episode was also the network’s most social program on Facebook and Twitter. Season 10 of Doctor Who is slated to debut this spring on BBC America. What do you think? Are you a Doctor Who fan? Did you enjoy the Christmas special? It was pretty good. Don’t know if I will like new female side kick. Not too appealing to the eye. Just hope she can act the part.